Kozue at the Park Hyatt Tokyo under the helm of talented chef Kenichiro Ooe is a wonderful traditional Japanese restaurant with amazing views of Mount Fuji on a clear day. Lunch was a gorgeous affair filled with seasonal spring May seafood and vegetables. 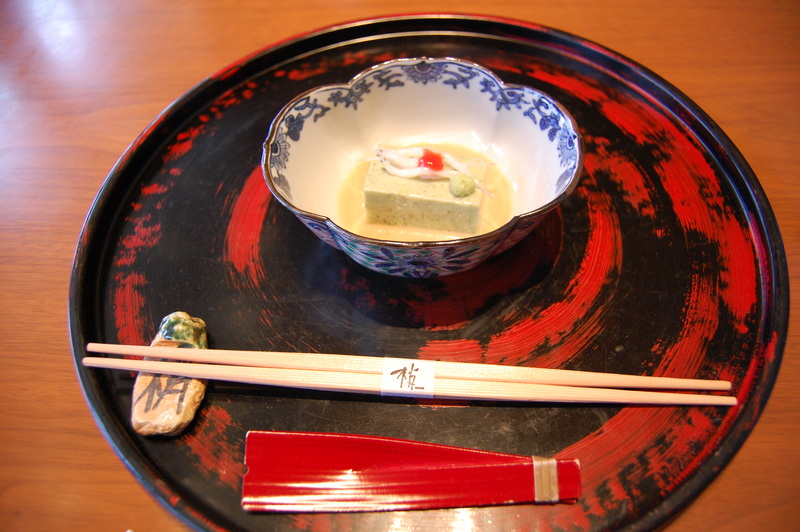 First course – Yomogi (mugwort) tofu garnished with shirasu, umeboshi neriume, gomadare (sesame sauce), and wasabi – loved the lacquer spoon at the bottom of the photo. First course close-up. 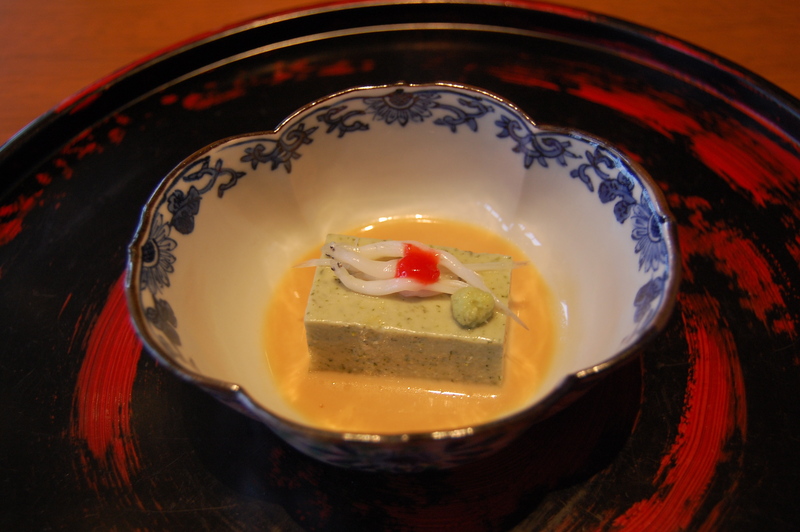 The yomogi is an earthy green which was a nice contrast to the sesame dressing. 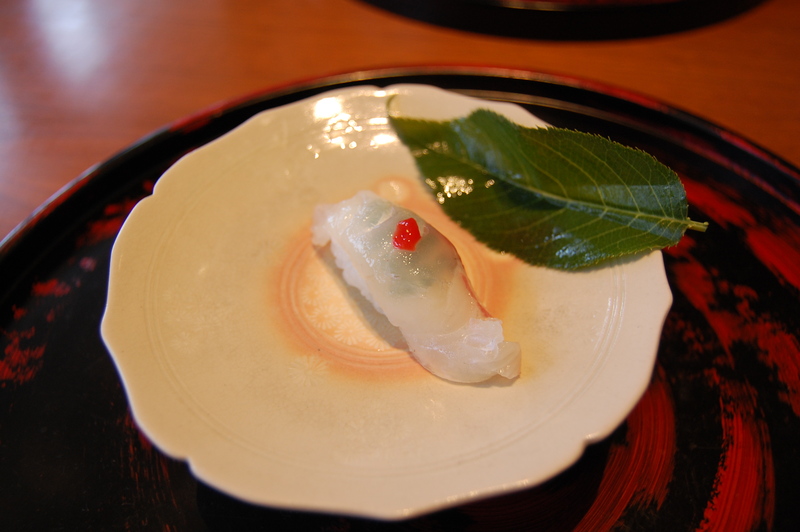 The tart umeboshi brightened up the palate and the shirasu added a nice texture and contrast to the dish. 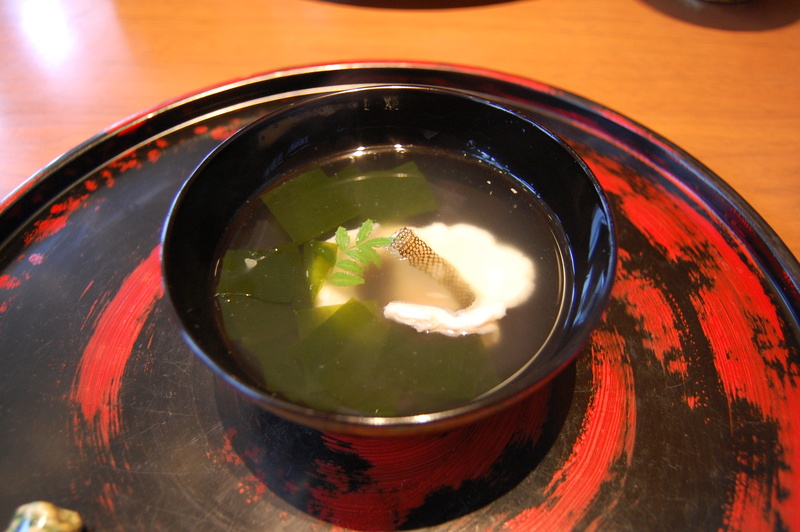 Second course – Ainame (greenling) with itawarabi (gelatin-like sheets made from bracken – this can only be made in the spring), and wakame soup with ki no me (tender leaves from Japanese prickly ash sansho). One of the pleasures of Japanese cuisine is that even after years of experiencing the cuisine, I am constantly learning about new ingredients. Today’s surprise was the itawarabi. It had a delicate, jelly-like texture. I thought it was a thin sheet of konnyaku. Chef Oe explained that it was itawarabi and something that is only made in spring when warabi are harvested from the mountains. 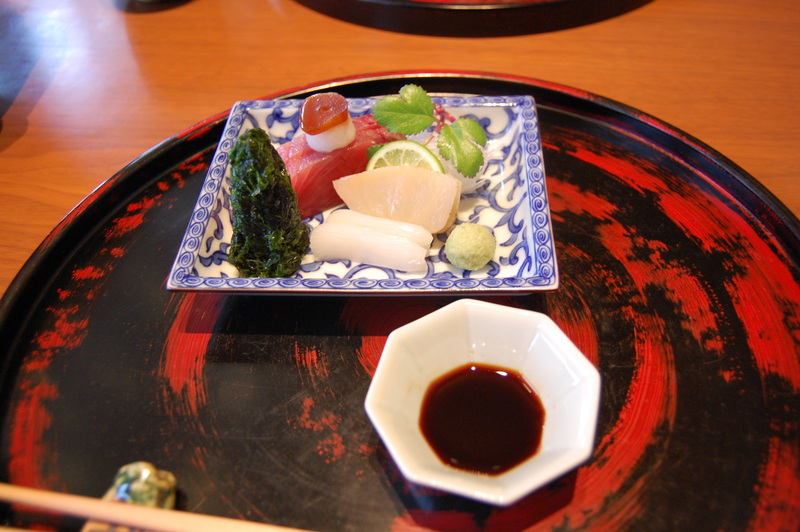 Third course – Sashimi course of tairagai (pen shell), katsuo with pickled rakkyo over grated daikon oroshi, ika (squid), and namanori (fresh nori), and julienned daikon. 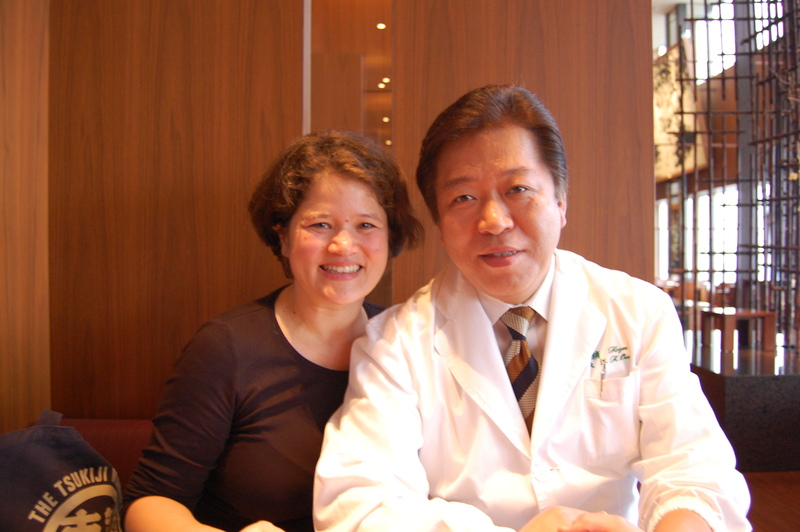 A famous chef from the US highly recommended Kozue to me. He said the cuisine was exquisite, but he was also taken with the presentation of the food and the serving vessels. 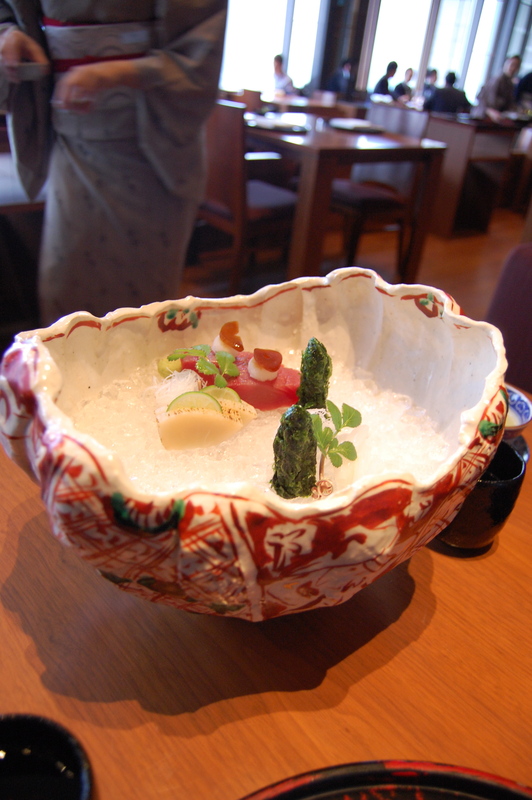 I understood when this sashimi course was presented in this large ceramic filled with crushed ice. The kimono-clad waitress then plated the seafood and garnishes onto serving dishes. A feast for the eyes indeed. See for yourself the difference from the above photo to the one below. 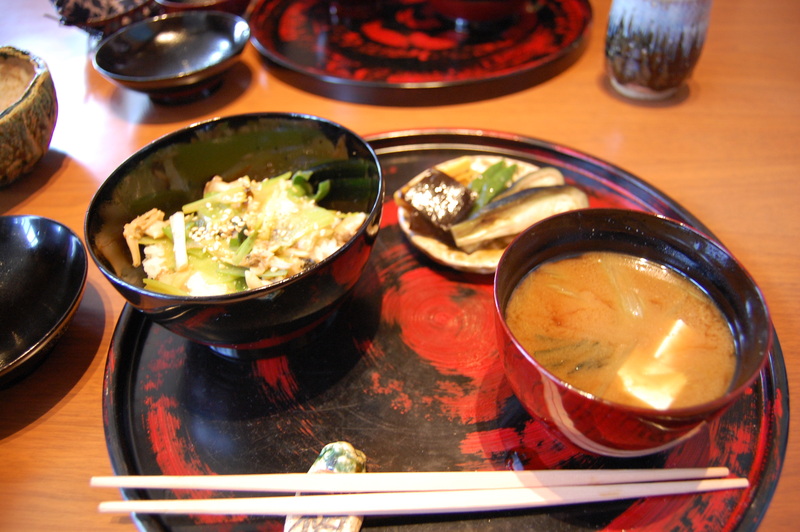 Third course – after arranged by waitress. My favorite was the tairagai which I don’t see much outside of Japan, notably sashimi grade tairagai. 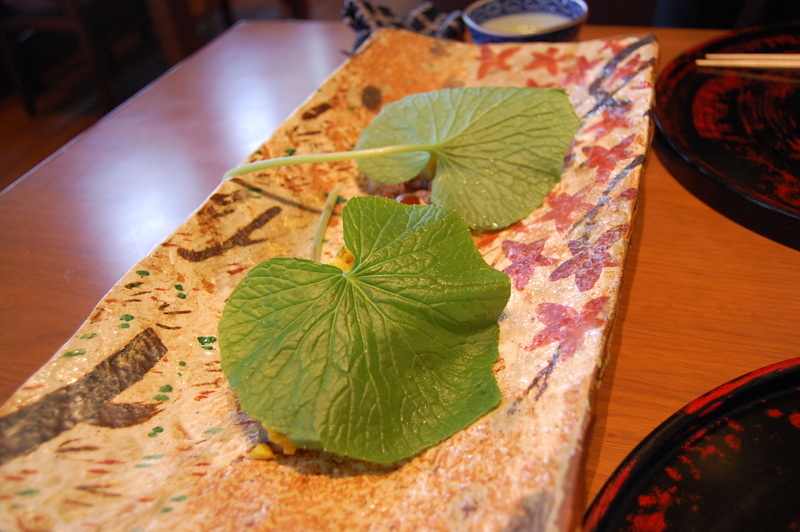 Fourth course – Again a beautiful presentation under fresh wasabi leaves. 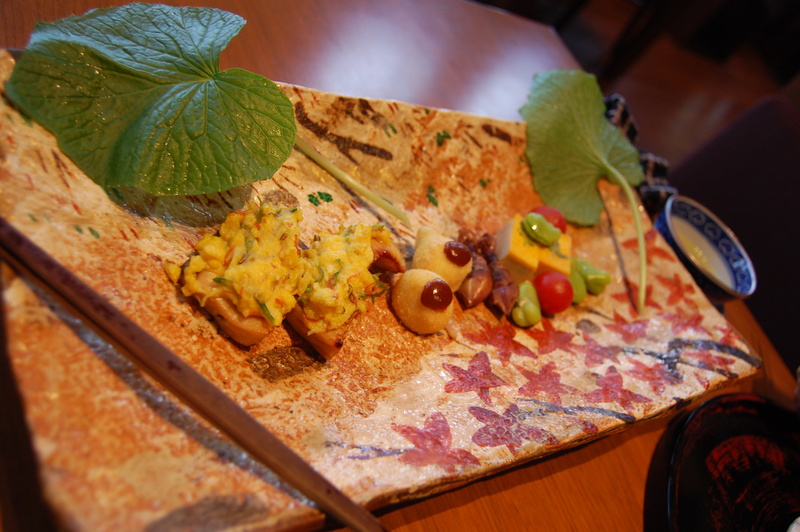 Fourth course uncovered – Spanish mackerel with eggs, hotaruika (firefly squid), kani (crab) potato croquette. 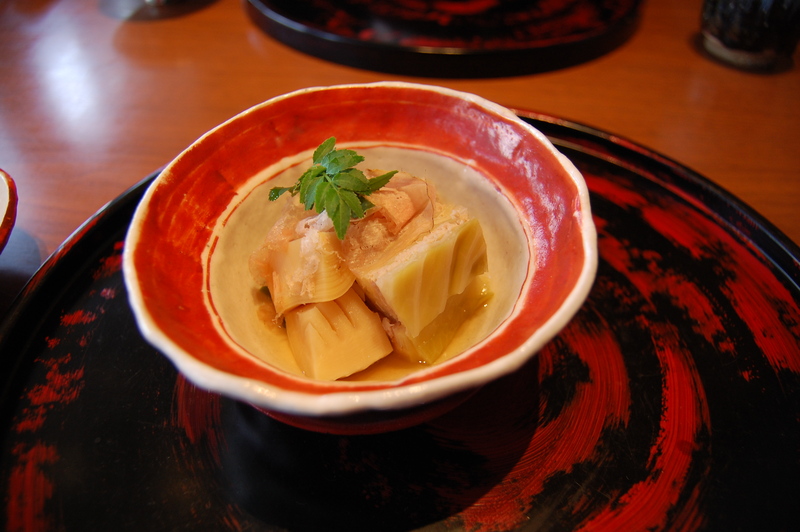 Sixth course – Takenoko (bamboo shoots) pork and cabbage (home-style rolled cabbage). This is a dish I will try to make at home. I love rolled cabbage but can’t be bothered with making the dish more than once a year. Here, chef Ooe stuffs the ground pork mixture into layers of cabbage that are then cooked. Brilliant idea. And, delicious. 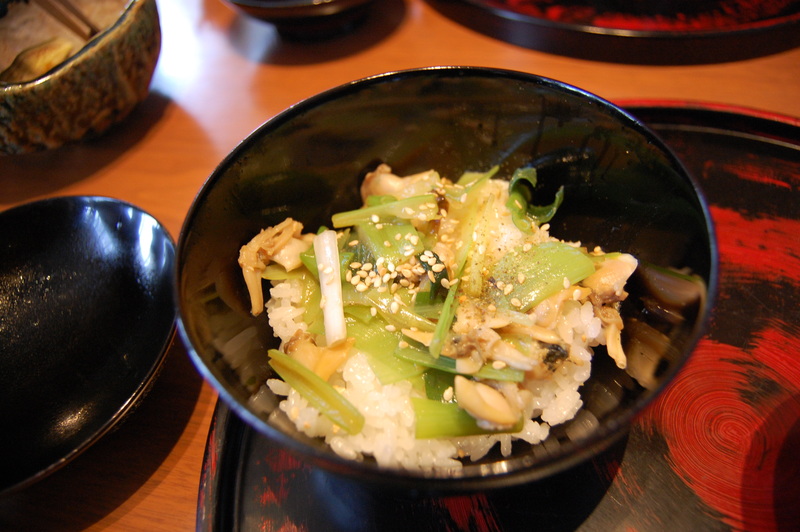 Seventh course – Asari gohan with pickles and fuki (butterbur) miso soup. Asari clams cooked with the rice. A nice way to end the savory dishes with. 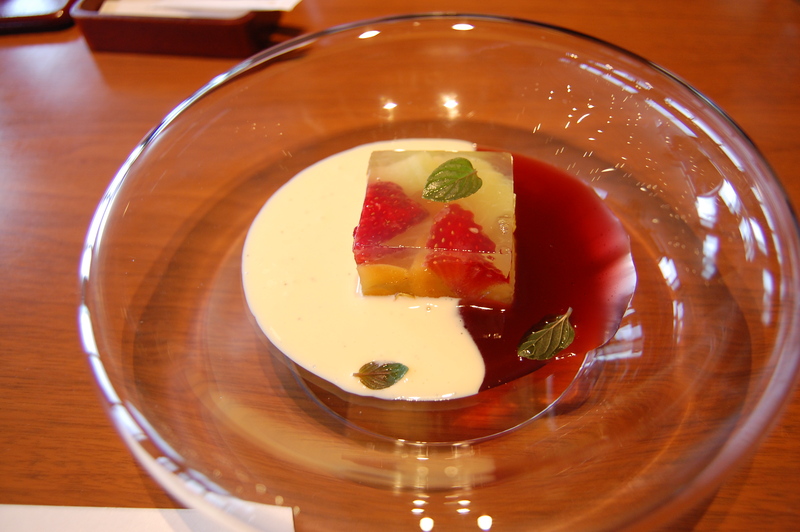 Eighth course – Yamabudo (mountain grapes) with ichigo strawberries and biwa (loquat) jelly and creme sauce and berry sauce. I love these large glass dishes. I have seen it used for both savory and sweet courses and it’s always a treat. This course was a nice, light finish to the many dishes. We had tea with our meal and I feel as though we were served at least two if not three types of tea throughout the meal. Service was lovely. And even though I speak Japanese it was nice to hear the staff explain each dish in English. They could answer all my questions which was also very impressive. While my eyes are mostly on the food, between courses looking over the room the high ceilings are impressive. The windows face West. So if the skies are clear Mount Fuji is just in front of you. On this weekday lunch the restaurant was very busy. A few tourists, several business lunches, and some ladies-who-lunch types. One option at lunch is to take your dessert at the Peak Bar & Lounge which is a restaurant on a different floor, also with high ceilings and great views, including a wall that overlooks Mount Fuji. I will do this next time I eat at Kozue. I had the pleasure of working a stage here back in 2005. It was stunning to watch a team of 10 chefs all working on 1 exquisite bento box with amazing precision. I remember Oe san’s politeness to a naive gaijin chef and try to follow his teachings in my own dishes. p.s. your blog is so inspiring! !